West Philly's Percy Bassett knocked out Ray Famechon in four rounds at Paris on this day in 1953. 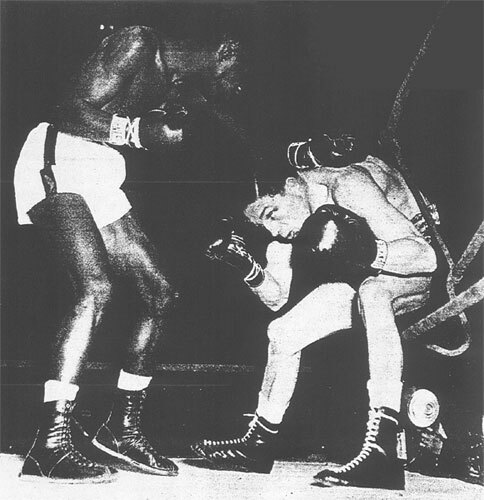 With world featherweight champion Sandy Saddler in the Army, Bassett's victory won him recognition as the "Interim" champ. The fight was one of his best performances and certainly the highlight of his 8-year ring career. Near the end of the third round, the sad-eyed Philadelphian flattened Famechon with a vicious left-right combination. The Frenchman was out cold but the bell ending the round saved him. When the bell sounded to start the fourth, Famechon was still out, forcing his corner to stop the bout. Once Saddler was discharged from his military service, everyone waited for a big fight between the true champion and Bassett. However, it never happened. Percy campaigned for the bout, but was never granted a shot at the great Sandy Saddler, presumably because Percy's manager, Mike "Bananas" Sokoloff refused to give up a piece of his financial interest to the organized crime figures who controlled much of boxing during that period. So Bassett never got the chance to win the traditional Ring Magazine championship belt. He was however, awarded a beautiful strap for beating Famechon in Paris on this day back in 1953. 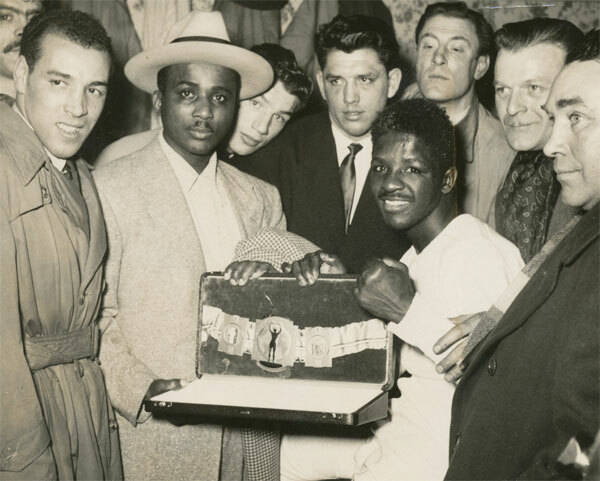 Percy is shown below holding that belt with trainer Quenzell McCall, and a crowed of well-wishers.